Patience is key when baking sourdough bread. You have to wait for your starter to mature. You have to wait for the dough to rise. Sometimes you have to wait longer than the recipe says and beg a little. Sometimes you even have to wait to make loaf number one into croutons and then try again! 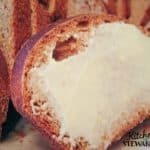 If you are a “need to see it” kind of person and would like to see a video of this recipe, check out the Traditional Cooking School’s Learn to Cook Sourdough Online eCourse. I’d love for you to join so you can see me demonstrate all the wrong ways to get sourdough to rise, and still end up with tasty bread at the end. 🙂 Check out all the lessons on traditional food preparations! There are over 20 different sourdough recipes in a multimedia format at Traditional Cooking School by GNOWFGLINS’ eCourses plus hundreds of other lessons in different categories. I think sourdough starters are kind of like…toddlers. I never really know what they’re going to do, but I keep feeding them and watching them. Feed your starter every day if it’s at room temperature or higher, with any grain and sometimes water. Stir well, scraping all the way down to the bottom of the jar/pot/bowl. 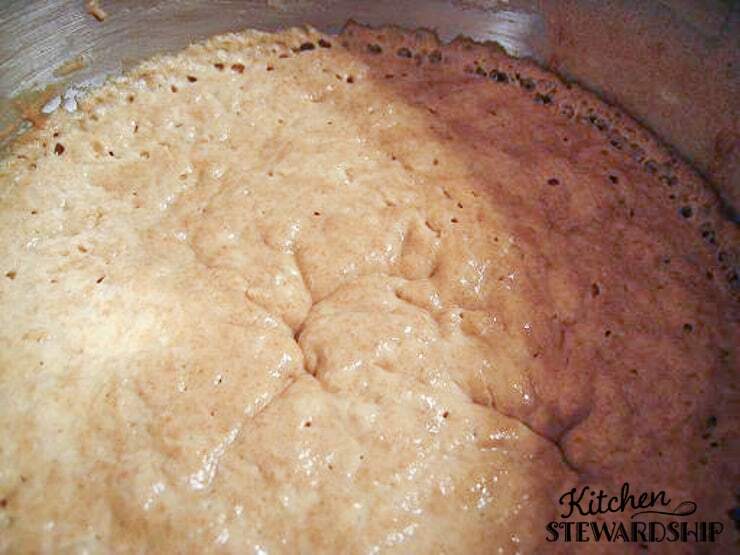 Keep your starter warm by leaving it on the stovetop when you cook. I generally get great bubble action when I do this, which sometimes results in this. Store your starter in the fridge if you don’t bake often. You still need to feed it once a week if it’s in there long term. I usually let it sit out to ferment at room temp when I feed it, then refrigerate again. Be sure to feed your starter every time you take some out for baking. How much? Most recipes say to replace what you took out – like if you use a cup of starter, mix in a cup of flour and a cup of water. Depending on your plans for your starter, you can add more or less and be just fine. As long as you have some starter left to continue your culture, nearly anything goes. Katz of Wild Fermentation claims that the starter clinging to the sides of the jar is enough to keep it going. Some recipes say to “discard” half your starter every time you feed it, so that’s where the lingo in this week’s recipes comes from. I don’t. I just feed and feed and feed – so if I’m getting too close to the top of my jar, I better use some! You can just use any starter for this week’s recipes. Once you take some out and give it a bigger feeding, it will be even more ready for bread baking, in my experience. adapted from Sarah at Heartland Renaissance (no longer available), who adapted it from Essentials of Baking cookbook. Lots of rising action here already, even in the sponge. If I don’t see this, I might need to offer extra time on the rising for the loaves. Does that look like any self-respecting bread dough? No way. That is why I couldn’t do this with my hands! When trying to figure out if you’ve kneaded enough or added enough flour, keep in mind that developing gluten, the substance in grains that enables a rise, is your goal. “Developed” gluten is sticky and allows you to stretch the bread dough. Elasticity would be a word to keep in mind. 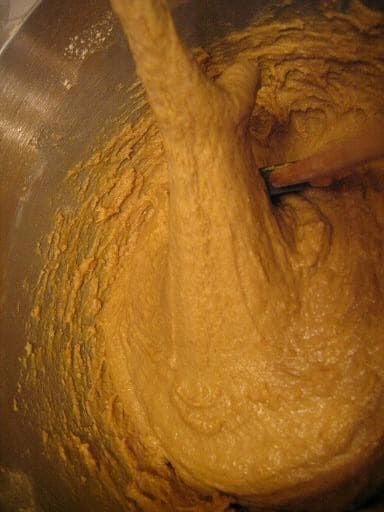 This bread dough below, for example, does not have developed gluten. I didn’t get that part. We’re still eating the croutons from November! Oops. You can use a sharp serrated knife and make a quick sawing motion or a small sharp knife to cut about 1/2 inch in. This sticky dough is a bit difficult to slash –you have to convince it to stay. I changed the original recipe by adding a half cup starter because I was worried I wouldn’t get it to rise. Now that I’ve had success, I’m afraid to take it back out, and I’ve even read since then that more starter decreases the overall sourness of the finished product, which is the opposite of what I expected! I also added a cup of flour to the sponge, taking it from the next day’s dough. My intent was simply to get more flour soaking overnight for more total phytate reduction. I use half and half traditional (red) whole wheat and white whole wheat, red for the gluten content and white for the lighter flavor. Sometimes I also use part spelt or rye flour (remember that rye is highest in phytase, so a great flour to use with sourdough). The recipe is very versatile! I also forget to set the butter on the counter sometimes and have replaced it with coconut oil in a pinch with fine results. It does take a long time to do proper sourdough bread. I generally knead the dough at breakfast and shoot to get it in the loaf pans around 3:00 to bake for dinner. To keep the fresh-baked crusty and crunchy crust, just store the entire loaf out in the air. Once cut, you can put the heel back on the end to keep it fresh or stand it on end on a cutting board. If you’re willing to give up on crunchy crusts, put it all in a bag or other airtight storage. I always at least let the loaves sit out overnight on the rack. 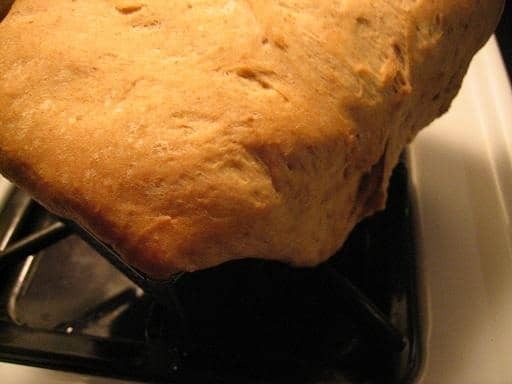 Many say that homemade bread doesn’t last very long, but in my experience, you can’t hardly convince this stuff to mold. I’ve read elsewhere that because sourdough is a fermented food, it does have the added longevity you would expect from a ferment. 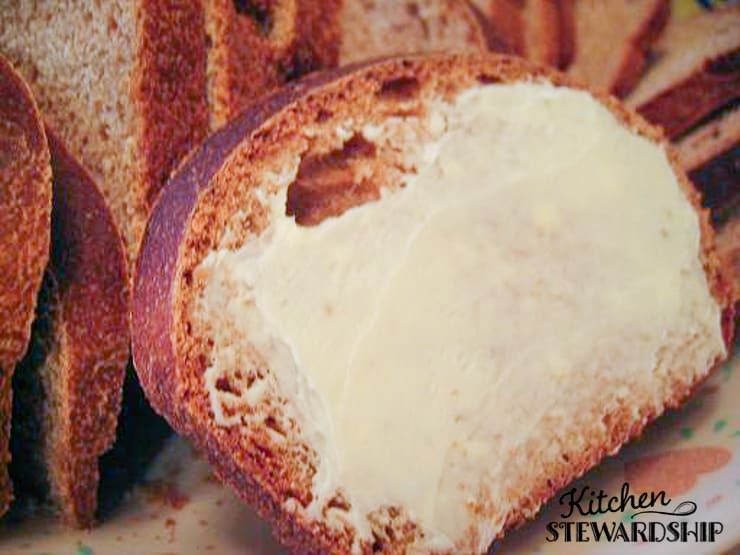 Don’t refrigerate bread (it will get stale but not moldy), but you could freeze it for the future if you like. If you freeze it, give it a day after baking before storing to increase the nutrient density even further, believe it or not. Slice it first if you like so that you can remove and toast individual slices any time. We love this bread! It’s not a perfect sandwich bread, but I think it makes good grilled cheese, and my kids will eat it as sandwiches. It slices so evenly that my mother-in-law couldn’t believe it wasn’t storebought. We love it best toasted with butter and honey – I think my kids could eat a slice at every meal and snack and be thrilled. We like it so much I’m almost afraid to branch out, although my husband does think this multigrain sourdough bread (no longer available) is even better. If I have a cup of leftover oatmeal, I’ll make that one, but it’s a compromise because it has a few cups of white flour. 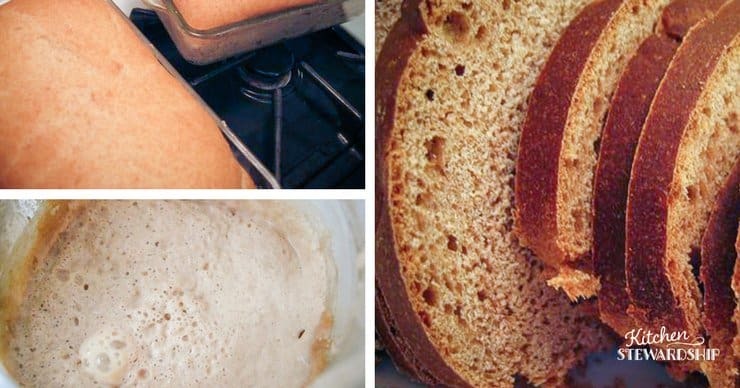 Sourdough Home – layers of information, including a starter primer and 100% whole wheat recipe. Breadtopia also has a whole grain sourdough recipe and is often recommended by readers, along with their no-knead bread method. Keeper of the Home’s troubleshooting – like me, Stephanie advocates a longer rise time if you don’t get what you want. Just keep waiting and don’t bake until you have reached a good-looking loaf! Her sourdough bread recipe is really simple. Here too is the Nourishing Gourmet’s Everyday Sourdough Bread. Bake at 350 has the most drool-worthy pictures of her bread. If only white flour was better for me! Disclosure: I am a teacher and affiliate of Traditional Cooking School by GNOWFGLINS and will earn a commission if you purchase a membership but it doesn’t change your price. Links to Amazon are also affiliate links. « Previous Post All About Whole Grains, The Difference Between Phytates & Phytic Acid, & What is the Role of Phytase in Soaking Grains? This is my 3rd attempt using sourdough and I’m trying your recipe. It’s on it’s second rise in the oven, (using your tip). I’m SO excited my starters are all doing well and I’m so happy to have found your blog. Pray for my bread! And I’ll tell you how I did! Oh, I forgot to mention in my first post… My first attempt at sourdough was a 100% rye sd. I ended up with a gooey brick. I would REALLY like to be successful with 100% rye so that’s my goal. Has you or anyone here tried and succeeded? 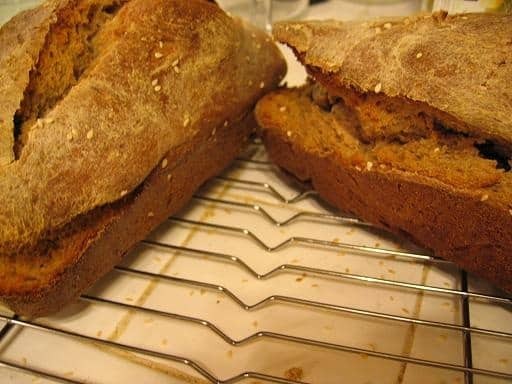 OMG… Beautiful loaf, crumb and slices like a dream, but WAY too sour… What the heck did I do wrong? If I could juice it, it would be straight lemon juice. I had to drowned it in butter and honey just to eat it… HELP! 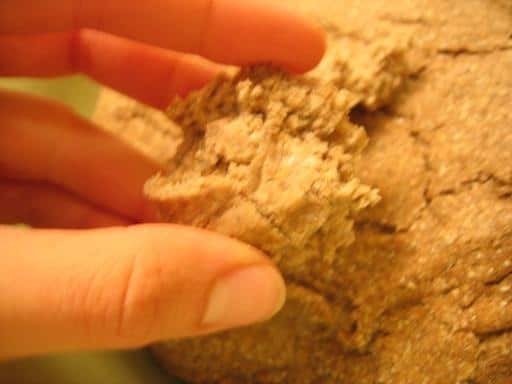 The recipe calls for rice and buckwheat flour – do and can these flours be soaked overnight and prepared like how you do it with your whole wheat flour? Love your site and all the awesome recipes! I look forward to my newest cooking adventure of adding wheat back in through fermentation and soaking. I found a Bread for life starter and dvd at Azure Standard and am currently growing my starter. It is done a little differently than a sour dough starter and suppose to be sweeter more like regular bread. I am really excited to try cooking with regular flour again. I plan on starting a rye starter for sourdough soon as well! Love baking!! And with blogs like yours I can actually look like I know what I am doing. 🙂 Thanks!! 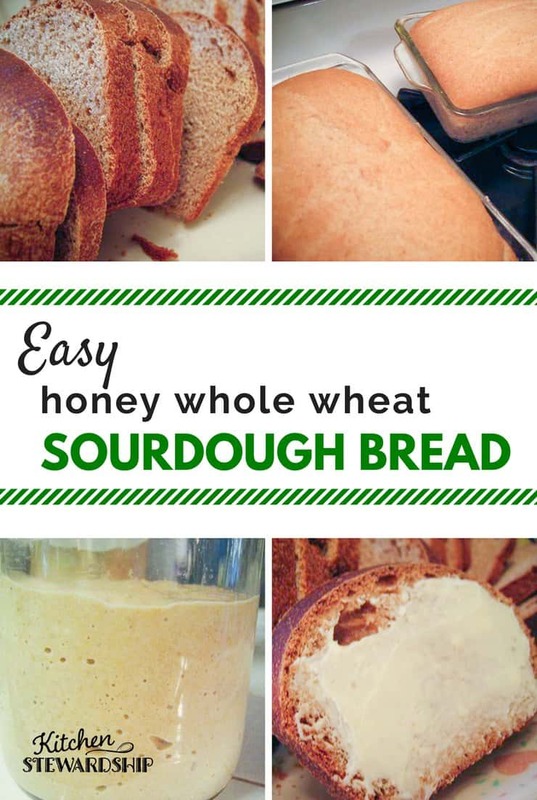 I found this recipe last week and made your sourdough bread this weekend. The only difference I had was that I used eikorn flour. Your recipe is amazing – LOVED it! I have never made a sourdough this light and fluffy. I will be making this again and again! I just made this bread, first time for sour dough, I made it exactly like the recipe and it is very good with the exception of being Very twangy, even with honey or jam. Any suggestions? Or is it suppose to be that way? I love sour dough bread but this has a bite. This is definitely my “everyday bread”. I usually make half this recipe on saturday and it lasts very well until thursday. I’ve already made it with water only and without the egg. The water only was maybe a little less soft, but just as good. The one without egg was a little drier, I guess I should have added the weight of the egg to the milk. The taste was similar on all variants by now. 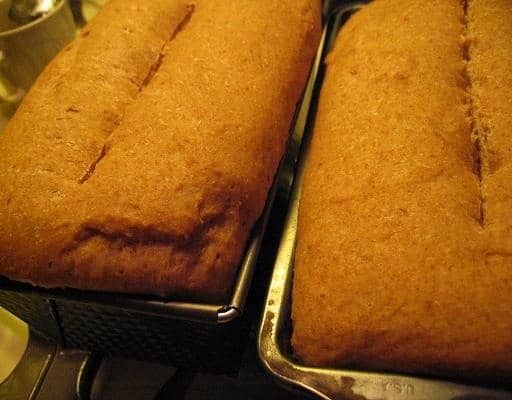 I often forget to make the sponge and I usually add 1/4 cup of linseed. I’m way late to the post here but going to comment anyways! I’ve been struggling to produce a good loaf of whole grain sourdough for a few months now and nearly ready to give up! My loaves always end up as heavy, dense bricks. I can’t figure out what I’m doing wrong! I have not tried this particular recipe and I’m afraid at this point of wasting anymore ingredients. I have never tried a recipe with eggs in it though so maybe that will help with the softness. Can you tell me why you don’t add all the flour to the sponge at one time? Also, if you have any troubleshooting tips for dense bricks please do share! Do you know if soaking the flour the night before in a cultured milk product, like kefir or yogurt would inhibit the fermenting process? Seeing as that milk is fermented itself? Have you ever tried that, or do you have any educated guesses on whether or not that would work? I soak all my other flour in kefir and/or yogurt, depending on what I have around. I have just started working with sourdough, so I’m curious!